is designed to Securely 3-Way Guy at 3 levels your ROHN H30 and Channel Master 1630, 1830, Telescopic Masts. Choose Guy wire gauge and Anchor size. Mast is not included. 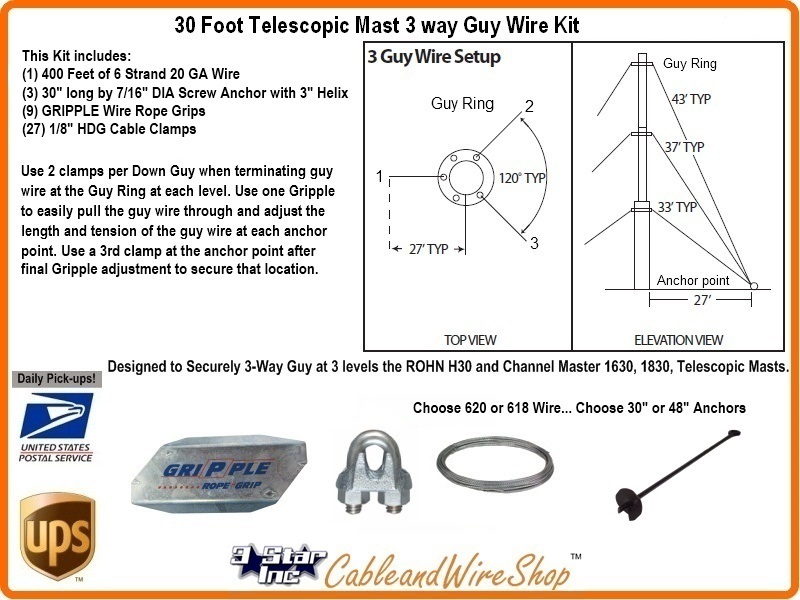 This 3-way Down Guy Wire and Anchor Kit for 30 Foot Telescopic Push Up Antenna Masts includes the Accessories needed to Securely affix a Ground Based Telescopic Mast at the 3 levels of Guy Rings supplied with the Mast for this purpose. This Kit does not include nor take into consideration any Base mount accessories or Alternate Base Structure such as a Roof nor the modification of guying necessary due to Structure Bracketing. As with all Masts, Guy wire support and Grounding are Critical to Antenna Survival. Reference the Telescopic Mast Buyer's Guide by Height to build or supplement your Telescopic Antenna Mast installation. 3-way Down Guy Kits are typically used for Ground based installations and 4-way Down Guy Kits are typically used for Roof based installations. Installations that are combination or hybrid and utilize substitution or additional structural components should be forwarded to and engaged by a Engineer qualified to make such determinations. Remember those older AM/FM Portable Radios with the antenna that you extended by pulling it out? Or the Radio Antennas on older cars that would pop-out, extend and retract when you turned on the radio? This Mast isn't an Antenna, but it extends and retracts by hand in similar fashion. Available in 20', 30', 40' and 50' heights. All ROHN telescoping masts are pre-galvanized and come assembled with hardware. Erection is made by simply connecting guys and brackets to the attached unique heavy duty rolled edge guy rings and clamps, extend each section one at a time (starting with the innermost section), insert the locking cotter pins, rotating the tubes to a locked position, and tightening the clamps. Repeat the process on each successive section until fully erect. The unique ROHN Products design features interior tube flanging combined with a double crimped exterior tube to produce a stronger and more stable joint than most common masts. This design exclusive also prevents the sections from accidentally pulling apart and allows disassembly by pulling each section out through the lower end. Each section extends deeper in to the lower tubes than most other designs, adding still further to the stability of the structure. This heavy duty series uses 1-1/4" 16 gauge galvanized tubing for top section. All other sections are 18 gauge. 1. Secure base and anchors (sold separately). 2. Attach lowered mast to base. 3. Secure guy lines to the lower Guy Ring and attach to anchors. Align the mast vertically by tightening the Guy Lines. 4. Secure upper Guy Ring using the appropriate Mast Clamp to desired location on the upper Tube (see note 8 on page 10). 5. Secure appropriate length guy lines to the upper Guy Ring and let them hang. 6. Raise the upper Tube and inset the cotter pin. Make sure that the cotter pin is inside the notch in the inside tube. 7. Secure the cotter pin and tighten the mast clamp. 8. Secure appropriate length guy lines to the next highest Guy Ring, and let them hang. 9. Raise the next smallest Tube and insert the cotter pin. Make sure that the cotter pin is inside the notch in the inside tube. 10. Secure the cotter pin and tighten the mast clamp. 11. Repeat steps 8-10 until all sections have been raised and are secured. 12. Attach all hanging Guy Lines to their respective anchor. Align the mast vertically by tightening the Guy Lines. Make sure to work your way up the mast while tightening. 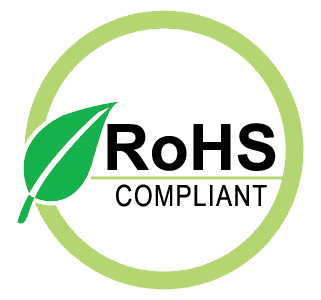 This Buyers Guide has will answer many questions you may have on this Product Line. For more detailed information and Specification Sheets covering many aspects of Various Parts, Accessories and Installation Scenarios... Please refer to the "Telescopic Mast" Link appearing in the Footer of this Page Below! Telescoping Masts are not recommended for commercial, CB or beam antenna installations. EZ TS-50 Free Standing Ground Mount - Up to 2-1/4"
Free-standing Ground Mount - fits masts up to 2-1/4"